“I wanna take you out,” he whispered. “Do bikers date?” she whispered back. 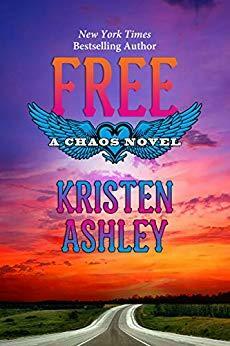 Free is the end of the beloved ‘Chaos’ series by Kristen Ashley and features a wide cast of characters from many of her favorite series. This is definitely not a standalone book as the story is written from many different POV’s. While Rebel and Rush are the central couple in the book, this was not their story alone. I absolutely loved when the story focused on this couple, though, as Rebel is one of THE most memorable heroines that Kristen Ashley has created. Now THAT’S why I read and love Kristen Ashley! Cole “Rush” Allen is very much like his dad, Tack, and Rush has his eye on Rebel. She’s gorgeous, spirited, smart and loyal. She is in an extremely dangerous situation with Benito Valenzuela and the story follows the Chaos MC as they try and take down the vicious criminal Valenzuela. As with all of Ms. Ashley’s books, family plays a big part in ‘Free.’ Rush’s father Tack is featured in this story as are the bothers of Chaos and other favorite characters form other books. The multiple POV’s did take me a little out of the story but I appreciated the appearance of so many of my favorite bossy, overprotective alpha heroes. There is a ton of action, humor, sweetness and tons and tons of hotness in ‘Free.’ Although I am sad to say goodbye to the Chaos series, I appreciate how the author wrapped up many of the loose ends from this series. I hope that some of these characters will appear in later books, and felt this was a fitting tribute to one of my favorite MC romance series. Omg thi is a great contest, Thanks for your review and sharing contest!